FOUR MORE YEARS! - I am so humbled that Silver Spring & Takoma Park voters re-elected me to another four year term in the House of Delegates. In my first term, I tried my best to stand up for you in Annapolis and find creative ways to deal with the Trump administration's impacts on Maryland. It's been an honor serving you these last four years, and it means the world to me that you signed up for even more of my off-beat political style. Thanks for the patience & the 38,892 votes of confidence! In the Democratic Primary, I was also re-nominated with 13,974 votes, giving me more votes than ANY other candidate for Delegate in Maryland's primaries this year & a new record for District 20 Delegates! Thank you, thank you, thank you to all my supporters, staff, family, donors, volunteers and endorsers. I am truly humbled. This win is more of an honor than in 2014, because back then you supported me for what I said I would do. This time you supported me for what I actually did. It's also gratifying to prove you can win office without any corporate donations & without hiring a consulting firm. I wrote and designed all of my ads, and every photo I used is from me actually engaging with people in the community. There's plenty more work to do, so let's stay in touch! WHAT I'VE BEEN WORKING ON: Read my email newsletters discussing policy & legislative updates below. Join my email list [ HERE ]. 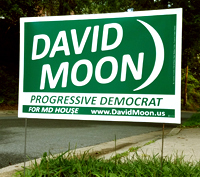 For constituent service issues or for questions about legislation, contact david.moon@house.state.md.us or (410) 841-3474. I have college & grad school scholarships for District 20 residents attending Maryland schools. Applications for 2019 will be due 4/30/19. For questions contact jjohnson@house.state.md.us or (410) 841-3474. The application link is at: http://tinyurl.com/2019mdschools.